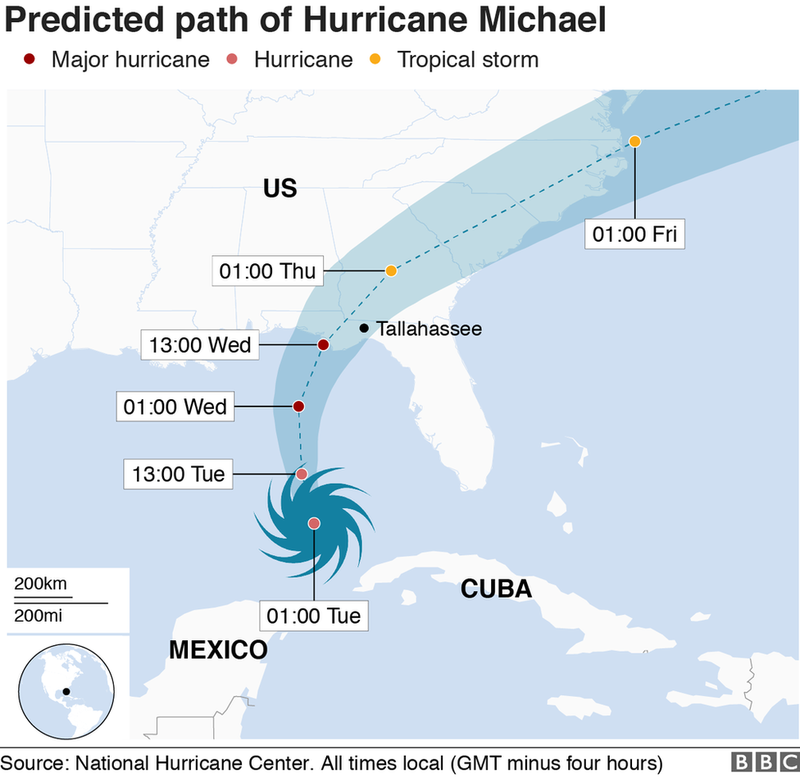 Hurricane Michael has strengthened to a category two storm, with winds topping 100mph (155km/h) as it churns towards the Florida coast. The storm is expected to reach category three before making landfall on Wednesday. Florida Governor Rick Scott has warned residents to evacuate. Alabama, Florida and Georgia have declared states of emergency in all or parts of the states. At least 13 people have reportedly died in Central America due to the storm. Governor Scott called for residents to evacuate, saying "It could be the difference between life and death." Alabama is under a statewide state of emergency ahead of the hurricane, along with 92 counties in southern Georgia and 35 counties in Florida. Forecasters say some regions of the US may see 12 inches (30cm) of rain, and storm surges of up to 12 feet (3.6m). The governor called Michael "a monstrous storm" and urged residents to listen to officials. It is expected to crawl up the US East Coast after making landfall on the Gulf Coast. Heavy rains are forecast for the Carolina's, which were drenched by Hurricane Florence last month. 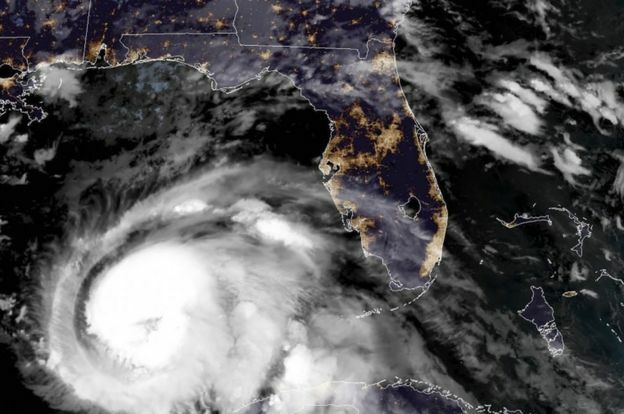 The US National Hurricane Center in Miami, Florida, warned on Tuesday that warm waters will probably further strengthen Michael before it makes landfall. Over 300 miles of coastline are currently under threat, the National Weather Service has said. The agency warned residents in Florida and Alabama of possible storm surges, high winds and flash flooding. American President Donald Trump told reporters on Tuesday: "We are very well prepared for the incoming hurricane." Governor Scott warned in a news conference that Hurricane Michael is a "massive storm that could bring total devastation to parts of our state, especially in the panhandle". He added that it is predicted to be "the most destructive storm to hit the Florida panhandle in decades". Some 120,000 people have been warned to evacuate along Florida's coast, where schools and state offices are to remain shut this week. Governor Scott warned that he may order more evacuations due to the size of the potential storm surge. "No one's going to survive" such a wall of water, he said. On Tuesday, Governor Scott said he activated 2,500 Florida National Guard troops in preparation for the storm. Images on social media showed evacuated families wading through water to get to safety. 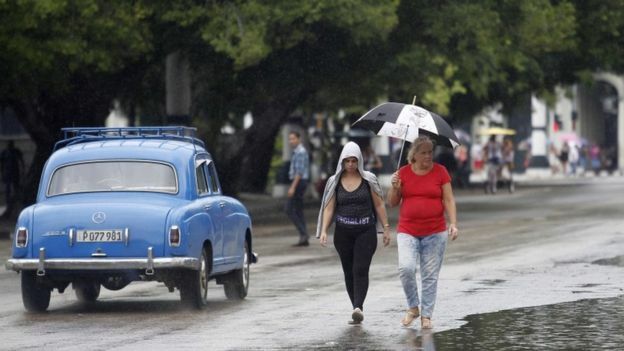 Parts of western Cuba, which was hit by the storm on Monday, were forecast to receive up to a foot of rain. Offshore oil platforms in the Gulf of Mexico have evacuated workers, halting nearly a fifth of daily production. Five drilling rigs have been moved out of the storm's path, according to the US Bureau of Safety and Environmental Enforcement. I've been watching CNN to keep up-to-date with what's happening over there. I have family in America so want to see what the storm is heading. Hope everyone stays safe over there!